Square 77 Construction Update/July 14, 2016: Substantial completion occurred in late June. While punch list work will continue across the building into the fall, units will be completed for student move in in late August. Sidewalks reopened on H and I streets in early July. Intermittent lane closures will continue on H and I Streets to facilitate furniture deliveries. Students will move into the building fall 2016. Square 77 Construction Update/May 15, 2016: The following interior work is underway: finishes/painting occurring throughout the building in common spaces; appliance installation complete; punch list work occurring throughout the building as well as elevator installations (with two elevators currently in use for construction). Exterior work includes installation of granite site walls and curbs -- pavers in front of the Eye and H Street facades is completed. To facilitate this work over coming months, sidewalks directly in front of the building will be closed so as to ensure pedestrian safety. Milling and paving on Eye Street, between 21st & 22nd Streets will occur on May 16-17 and possibly May 18 if an additional day is required due to inclement weather. Roofing work continues across the site. Installation of the green roof is 85% complete. Final inspections are on-going throughout the building. Square 77 Construction Update/April 15, 2016: The following interior work is underway: terrazzo flooring installation continues on levels L1 and B1; finishes/painting occurring throughout building in common spaces; appliance installation complete; punchlist work occurring throughout the building as well as elevators installation (with two elevators currently in use for construction). Exterior work includes installation of granite site walls, curb, and pavers in front of the Eye and H Street facades through late-April. To facilitate this work over coming months, sidewalks directly in front of the building will be closed so as to ensure pedestrian safety. Roofing work continues across the site. Installation of the green roof is anticipated for next week. Square 77 Construction Update/March 25, 2016: The following interior work is underway: terrazzo flooring installation on B1 level; hanging drywall in floor 1 common spaces; appliance installation on floors 11/12; punchlist work occurring throughout the building as well as elevators installation (with two elevators currently in use for construction). Exterior work includes installation of granite site walls, curb, and pavers in front of the Eye and H Street facades through mid-April. To facilitate this work over coming months, sidewalks directly in front of the building will be closed so as to ensure pedestrian safety. Roofing work continues across the site. Installation of the green roof is anticipated mid-April. Square 77 Construction Update/February 18, 2016: Interior work: Hanging drywall is completed on all residential floors and work is now focused on finishes on all residential floors and the B1 & B2 levels. Installation of elevators continues, with two elevators currently in use for construction. Exterior work: Work now focuses on adjacent sidewalk and streets on both the H and Eye Street facades. To facilitate this work over coming months, sidewalks directly in front of building will be closed so as to ensure pedestrian safety. Related to this is improvements to the Marvin Center alley/loading dock area, which remains closed into April to all vehicles except unless construction-related. Road Closures: The 2100 block of Eye Street will be closed with a crane Saturday 2-20-16 ( Sun 2-21-16 as a weather back-up date) to hoist materials to the roof. The sidewalk and curb lane on both the H and Eye Street facades remain closed until the building completion in early summer. Square 77 Road & Lane Closure/February 18, 2016: February 20 (and Feb 21 if needed)/2100 block of Eye: So as to facilitate placement of a temporary crane, the 2100 block of Eye Street (between 21st and 22nd Streets, NW) will be closed to vehicular traffic for portions of Saturday, February 13. Due to weather delays/reschedules of this effort, February 21 is also being reserved as a backup day in case of inclement weather on February 20. Pedestrian traffic will at certain times be limited, with flaggers providing direction. Staff will be on hand to ensure traffic flows continue in this area during the installation process, pursuant to an approved traffic control plan. Access to the AC garage will be limited. Signage will be posted in advance to those who normally park in the garage on Saturdays and other options offered. MFA access should not be affected, nor will the Whole Foods garage. The garage of the 2100 Pennsylvania Avenue office building (which is accessed via north side of 2100 block of Eye Street near Fridays Restaurant) and access to the Academic Center garage further west in the block near 22nd Street may not be possible so drivers are asked to not use this garage on that day. Square 77 road closure January 30 & 31/2100 block of H: So as to facilitate placement of a temporary crane, the 2100 block of H Street (between 21st and 22nd Streets, NW) will be closed to some or all of vehicular traffic for portions of Saturday January 30 and Sunday January 31. Vehicular lanes on this block will be reduced when the crane arrives onsite early Saturday morning (apx. 4:00 a.m.) and, once the crane is fully installed later that morning, traffic will not be permitted on this block until the end of Saturday's workday. During the closure there will be limited pedestrian access at times. If the area can be avoided it is advisable. Full closure of this block to vehicular traffic will continue until work is completed that day and the crane has been removed. Staff will be on hand to ensure traffic flows continue in this area during this process, pursuant to an approved traffic control plan. Garage access is not an issue as the MC garage is closed and GWPD is making arrangements to access their vehicles. Square 77 Construction Update/January 20, 2016: Interior work: Hanging drywall is completed on all residential floors and work is is now focused on finishes. Installation of elevators continues, with two elevators currently in use for construction. Exterior work: The restoration on Schenley & Crawford exteriors is complete. Swing stages will be removed from West End facade within the next two weeks or so as that part of the envelope restoration will be complete with the exception of some minor on-going work. Exterior hoist on the Marvin Center side of the projecct has been removed. Historic window installation continues on the historic exterior facades. Brick and metal panel installation is complete. Road Closures: The 2100 block of Eye Street will be closed with a crane Saturday/1-30-16 to hoist materials to the roof. The H Street sidewalk and curb lane in front of the project is now closed until the building opening in early summer. Square 77 Construction Update/November 13, 2015: Hanging drywall continues on the upper floors and, upon completion, is followed by finishes, including: kitchen casework, toilet accessories, tile, prime paint/point up/paint. Swing stages will continue to be used on West End and Crawford facades as part of the envelope restoration for another several weeks. The restoration on Schenley exterior is complete. Historic window installation continues on the historic exterior facades. Brick installation on the east and west elevations continues with metal panel installation also occurring on the west elevation. Installation of elevators 1-8 continues, with elevator 8 scheduled for operation in the next few weeks for construction use. The crosswalk on Eye Street (west side) was repaved and repainted last month. A temporary crane will be used to assist in the removal of the hoist and this will likely require a lane closure on Eye Street. Once details are finalized, an update will be posted on the Lane and Road Closures page of this site. Square 77 Construction Update/October 16, 2015: Drywall installation followed by painting is occurring between floors 3 - 10. Rough-in work is taking place on floors 11 and 12. Vanities are being set and casework installation is occurring on floor 1 and will continue through the building behind the drywall and painting. Elevators 1, 4, 5, and 8 are being installed. Swing stages continue to be used on West End and Schenley facades as part of the envelope restoration. This work is anticipated to continue for another 4 - 6 weeks. Window installation continues to occur throughout the space. The crosswalk on Eye Street (west side) will be repaved and repainted later this month. A temporary crane is also anticipated for the site to assist in the removal of the hoist- this will likely require a lane closure on Eye Street. Once details are finalized, an update will be posted on the Lane and Road Closures page of this site. Square 77 Construction Update/September 11, 2015: Swing stages continue to be used on West End and Schenley facades as part of the envelope restoration. This work is anticipated to continue for another 8 - 10 weeks. Window installation on the West End facade began in early September. 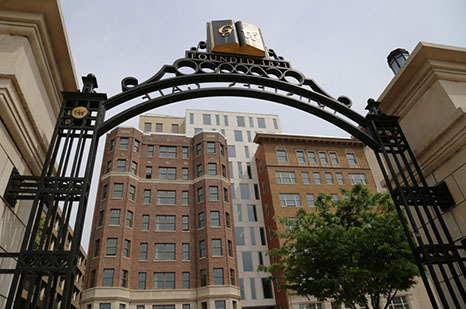 Window installation on the Schenley and Crawford facades is scheduled to begin in mid-September. Drywall installation on floors L1-L8 is anticipated to be completed in early October. Mechanical, electrical, and plumbing (MEP) continues throughout the site. Elevator installation continues across the site. The crosswalk on Eye Street (west side) will be repaved and repainted later this month. Once details are provided and updated will be posted on the Lane and Road Closures page of this site. Square 77 Construction Update/August 14, 2015: The weekend of August 22, the north tower crane is scheduled for removal – Eye Street between 21st and 22nd Streets will be closed to facilitate this removal. During this time, the road will be closed at both 21st and 22nd Streets with access to the garages located on Eye Street maintained by flaggers on site. The sidewalk on the north side of Eye Street will remain open. Utility connections to the site are substantially complete. Window installation and caulking is taking place across the site. Precast installation continues at the penthouse level. Swing stages continue to be used on West End and Schenley facade as part of the envelope restoration. This work is anticipated to continue for another 10 - 12 weeks. Square 77 Construction Update/July 17, 2015: The weekend of July 25, the south tower crane is scheduled for removal – H Street between 21st and 22nd Streets will be closed to facilitate this removal. All utility connections are expected to be completed by early August, with the exception of the gas service that is on Eye Street. Window installation and caulking is taking place across the site. Precast installation continues at the penthouse level. Mechanical, Electrical, Plumbing (MEP) riser installation continues on levels 8-12. The interior continues to take shape as floors are laid out, framed, and then drywall is installed. Swing stages continue to be used on West End and Schenley facades as part of the facade restoration. This work is anticipated to continue for another 14 - 16 weeks. Square 77 Construction Update/ June 12, 2015: Exterior framing is substantially completed across the site. Air barrier installation continues on the east and west elevation. Punch window installation is taking place on Levels 1 through 4. Precast installation continues on the east elevation and penthouse. Mechanical, Electrical, Plumbing (MEP) riser installation continues on levels 2-10. The interior continues to take shape as floors are laid out, framed, and then drywall is installed. With the removal of the steel support structure, cleaning and repair work has begun on the historic facade. During the week of June 15, swing stages will be set up on the West End and Schenley facades. This phase of work will take 16-20 weeks. Square 77 Construction Update/ May 29, 2015: Work continues on the south, west, and east side facades with exterior framing completed through Level 9 and continuing work on the east installation's exterior sheathing and the west elevation's air barrier installation. After hours precast installation continues on the south and east side elevations and is anticipated to continue through June. Steel support structures on the West End, Schenley, and Crawford facades are scheduled to be removed in early June. Road closures on H and I Streets between 21st and 22nd Streets will be required for this work. These updates are posted on the Lane Closures section of the website. Mechanical, Electrical, Plumbing (MEP) risers are being installed on levels 2-10. The interior continues to take shape as floors are laid out, framed, and then drywall is installed. Square 77 Construction Update/ April 24, 2015: As the building approaches "topping out" (industry shorthand for the fact that the structure is nearing its highest point/the roof level), work on site will begin to change. Work continues on the west side which faces Academic Center and when exterior framing up to level 6 is completed, workers on hydraulic lifts will begin to install sheathing. While activity associated with this work will be different, it is not anticipated to be exceptionally loud. Weather dependent, concrete pours for levels 11 and 12 should be completed in early May. Backfill on the east side was completed during the second week of April. Drywall framing and hanging has begun on the B1 and B2 levels. Interior framing is anticipated to begin the middle of May. Mechanical, Electrical, Plumbing (MEP) risers are being installed on levels 2-7. In May, the primary focus will be exterior framing and installation of sheathing. The interior will begin to take shape as floors are laid out, framed and drywall installation begins. Square 77 Construction Update/ March 13, 2015: Weather dependent, concrete pours for level 6 and level 7 should be completed by the end of March and will be followed by concrete pours on level 8. Mechanical, Electrical, Plumbing (MEP) rough-in work, block walls and dry wall framing continues on levels B1 and B2. There will be increased truck traffic on Eye Street on Saturdays in March as large equipment is delivered and offloaded into the Academic Center and Marvin Center alleys and the existing Eye Street curb lane. The Academic Center alley is anticipated to be reopened by the second to last week of March. Square 77 Construction Update/ February 20,2015: Weather dependent, concrete pours for level 5 will be completed by the end of February, in addition to the first pour of level 6. Duct work, MEP, and dry wall framing continues on levels B1 and B2. Beginning in early March, there will be an increase in truck traffic on Eye Street on Saturday's as deliveries of large equipment will are delivered to the site. They will be off loading materials from the Academic Center Alley, Marvin Center Alley, and the existing Eye Street curb lane. Square 77 Construction Update/January 16, 2015: Concrete work continues upward – B2, B1 and L1 are complete. Framing and pouring of Levels 3 thru 8 will take place over the next few months. This work includes framing and pouring of walls, columns, and floors, as well as stripping of previously poured walls. Mechanical, electrical, and plumbing rough-in work continues on the B2 level and will follow upward as concrete is finished. During the last two weeks of January PEPCO will be working on Sundays and on some nights in the Marvin Center Alley to set the transformers in the vault and also to pull cable. This work will not be disruptive. Square 77 Construction Update/December 1, 2014: Concrete work continues through levels B1 through 3. This work includes framing and pouring of walls, columns, and floors, stripping of previously poured walls. Stripping is when they remove the forms once the concrete has reached sufficient strength. Mechanical, electrical, and plumbing is beginning on B2 and will follow upward as concrete finished. Academic Alley backfill is completed and is scheduled to be reopened the night of December 10. This will be the last project update for 2014. We will resume updates in early January. Square 77 Construction Update/November 3, 2014: Concrete work continues across the site with the pouring of walls and columns at the foundation and slab on grade levels. During November the B1 and 1st Floor elevated decks will be poured. As concrete work continues there will be an increase in concrete trucks on Eye Street. Flaggers will remain in front of the site to continue to manage traffic. The Academic Center alley will remain closed for the rest of November. Those who are expecting large deliveries during the closure of the Alley Way (October-November) should coordinate with Nancy Balph (GW Construction Project manager – [email protected]). Square 77 Construction Update/October 1, 2014: Construction of pile caps and pits continues through early October on the north side of the site. Concrete work began in late September and will continue through October. During the early part of the of the month, slab on grade will continue to be poured. By mid-October the first elevated deck will be prepared and poured at the south end of the site. As concrete work continues there will be an increase in concrete trucks on Eye Street. Flaggers will remain in front of the site to continue to manage traffic. Beginning Friday, October 9 the alley way to the academic center will be closed. On Saturday, October 10 the temporary concrete loading ramp will be demolished. This work has been scheduled on a Saturday so as to minimize the amount of impact on the Academic Center. Those who are expecting large deliveries during the closure of the Alley Way (October-November) should coordinate with Nancy Balph (GW Construction Project manager – [email protected]). Square 77 Construction Update/September 5, 2014: Excavation and lagging is complete across the site. Caisson installation completed in July. The south tower crane was installed the last weekend of July, and the north tower crane was installed in mid-August. Construction of pile caps and pits are occurring on the south side of the site and will move to the north side of the site in the coming weeks. By mid-September the ramp is expected to be substantially removed from the pit and installation of underground mechanical, electrical, and plumbing (MEP) systems will have begun. All should be aware that beginning the first week of October and lasting through November the alley way to the academic center will be closed. This includes access to the loading dock. A meeting was held September 5 with representatives from departments who are known to regularly receive large deliveries at this location. Those who are expecting large deliveries during this time frame should coordinate with Nancy Balph (GW Construction Project manager – [email protected]). More details about this work will be shared soon. Square 77 Construction Update/August 5, 2014: A second crane will be erected at the District House site on Saturday, August 16 and will remain on site through the duration of the raising of the concrete structure and slightly beyond, which will be for at least the next year. Federal OSHA regulations require that a horn be blown prior to the crane lifting any materials and/or whenever it swings over people. You will hear the horns regularly, but please know that there is no cause for concern. The horn will sound for several minutes at a time, and we anticipate that the horns will be blown consistently throughout the day -- however, despite the potential frequency of this horn notice we do not anticipate it will be distracting to occupants of adjacent buildings. Square 77 Construction Update/July 31, 2014: On Saturday, August 2, a crane will be installed at the H Street side of the District House construction site. In order for the crane to be installed, there will be a road closure on H Street, between 21st and 22nd Streets, NW, beginning at 6am and lasting until 3pm. Access to the Marvin Center Garage will be maintained throughout the closure by way of 21st Street. There may however be intermittent time slots when cars will be held back from entry of exit as the equipment is in the street. These time slots will range from 10 to 30 minutes. The installation of the crane will not directly impact noise levels on the site. The site's ramp will be removed over the next couple of weeks and construction will transition from excavation activities to the building phase. Noise levels may increase at that time. This will be the first of two crane installations for District House. The second crane will be installed Saturday, August 16, and will necessitate the closure of I Street between 21st and 22nd Streets. An update will be provided prior to this closure. Square 77 Construction Update/June 5, 2014: Pouring of the underpinning pits is anticipated to continue through the end of June. The second phase of caisson mobilization is scheduled for the third week of June. Caisson work and excavation will continue through June and into July. The next update is scheduled for July 1. Square 77 Construction Update/May 19, 2014: Excavation and lagging continues across the site. The first phase of caisson work was completed May 13, with the second phase anticipated to begin again in early June. The utility work on H Street was completed in early May. Square 77 Construction Update/May 2, 2014: Excavation and lagging work is taking place on the north side of the site (near Eye Street). Underpinning pit construction has begun along the west end of the site. The first phase of caisson work is expected to be completed next week, and the second mobilization is anticipated to begin in early June. What is a caisson? A caisson can be thought of as a temporary casing that allows the installation of a large concrete pier underground by holding the back as rebar is installed and concrete poured. The casing is then removed. The caisson process is really just a larger pile drilling operation with larger equipment and larger holes to fill. At the end of the day, these concrete piers (or nicknamed caissons because of the process involved) make up the permanent foundation that holds/supports the building in place. Conventional building foundations consist of a spread footing sized for the load the wall or column will put on that footing. This is similar to what was removed from the old buildings during demolition. Spread footings need enough dirt that can take the load of the building. On this site, the dirt was not sufficient enough to just do footings and the building is deeper and larger than the old buildings removed. As such a deep foundation system is being used that will allow the load bearing structures of the new building to sit on rock. The deep foundation system chosen for this project is caissons. The Marvin Center and Academic Center buildings both sit on caissons. Square 77 Construction Update/April 18, 2014: Excavation is taking place across the site, and lagging is occurring along the north end of the site. Work on the underpinning pits, located under the Academic Center Alley, are expected to begin next week. The first phase of the caissons installation will continue through April. The DC Government has completed utility work on H Street. Work on water abandonments will begin after hours on H Street. Intermittent increases in noise expected. Marvin Center alley will be closed Sunday, April 6 to complete cuts of the east and west facing walls of West End. Air filters will be cleaned on the Academic Center during the second week of April. Teams conducting this work will be doing so from the exterior of the building. Square 77 Construction Update/March 21, 2014: The Academic Center alley closed Tuesday, March 11; pedestrians and vehicles will not be permitted access until the alleyway is completed. Still on schedule to reopen at the end of March. There will be intermittent increases in noise and vibrations during this phase of construction. Saw cutting of the underpinning pits at Schenley and Crawford will begin Monday, March 24. Hauling of demolition debris Is complete at the site. Hauling of excavated materials will increase this week. The DC Government is conducting utility work on the 2100 block of H Street. During this work there may be intermittent lane closures. This work may occur after hours. Square 77 Construction Update/March 14, 2014: The Academic Center alley closed Tuesday, March 11; pedestrians and vehicles will not be permitted access until the alleyway reopens at the end of March. There will be intermittent increases in noise and vibrations during this phase of construction. Hauling of demolition debris is expected to continue through the end of March. Pile drilling is taking place throughout the site and will continue over the next couple of weeks. In coming weeks, it is anticipated that the DC Government will be conducting utility work on the 2100 block of H Street. During this work there may be intermittent lane closures. This work may be after hours. Square 77 Construction Update/March 7, 2014: The alley closing scheduled to begin Thursday, March 7 was postponed until Tuesday, March 11 to help facilitate increased removal of debris. There will be an increase in truck traffic on Eye Street during this period. When the Academic Center alleyway will closes on March 11, pedestrians and vehicles will not be permitted access. It will remain closed through the end of March. This work will increase noise and vibrations experienced by the Academic Center. This closure will allow for support work for the new residence hall, including demolition of the alleyway's asphalt and concrete. There will be intermittent increases in noise and vibrations during this phase of construction. Square 77 Construction Update/February 28, 2014: Beginning Thursday, March 6, the Academic Center alleyway will close to pedestrians and vehicles, and will remain closed through the end of March. This work will increase noise and vibrations experienced by the Academic Center. This closure will allow for support work for the new residence hall, including demolition of the alleyway's asphalt and concrete. There will be intermittent increases in noise and vibrations during this phase of construction. At times noise will be comparable to the Academic Center loading dock demolition that occurred in November 2013. The most noise intensive days are expected to be March 6, 7, and 8. Hauling of rubble and construction debris continues. Demolition work at West End continues. The building has been completely separated and the large equipment is at work now, taking down the rest of the building. That work is expected to be completed by Wednesday March 5. Square 77 Construction Update/February 21, 2014: Demolition work continues on the three existing buildings, and this continues to create increased levels of noise. This work is anticipated to continue into mid-2014. Demolition work at West End is anticipated for completion the 1st week of March. Depending on weather, temperatures, and site conditions, permitted night work may take place between 7 p.m. - 5 a.m. during the month of February. During this time, there will be periodic shifts of vehicular lanes and noise being produced on Eye Street. Any lane closures will be communicated in advance. Once the work is completed is on Eye Street, the work will shift to H Street for the month of March. Beginning March 6, the Academic Center alleyway will close to pedestrians and vehicles, and will remain closed through the end of March. This closure will allow for support work for the new residence hall, including demolition of the alleyway's asphalt and concrete. There will be intermittent increases in noise and vibrations during this phase of construction; we will complete as much of the noise-intensive work as possible during the week of Spring Break (March 10 - March 15). At times noise will be comparable to the Academic Center loading dock demolition that occurred in November 2013. Square 77 Construction Update/February 14, 2014: Demolition work continues on the three existing buildings, and this continues to create increased levels of noise. This work is anticipated to continue into mid-2014. The façade has been separated from the primary structure of the West End. Demolition work at West End is anticipated to continue through the remainder of February and into the first week of March. Hauling of rubble and construction debris from Schenley and Crawford continues. Below grade demolition is scheduled to begin on the H Street side of the site during the last two weeks of February. As demolition increases, awareness should be heightened when in close proximity to the construction site. Only authorized personnel should use the alleyways adjacent to the construction site and only for official purposes. Depending on weather, temperatures, and site conditions, permitted night work may take place between 7 p.m. - 5 a.m. during the month of February. During this time, there will be periodic shifts of vehicular lanes and noise being produced on Eye Street. Any lane closures will be communicated in advance. During the month of March, the Academic Center alleyway and loading dock will be closed as part of the early stages of sheeting, shoring, and excavation. GW faculty, staff, and students will not be permitted in these areas for any reason. Square 77 Construction Update/February 6, 2014: Demolition work continues on the three existing buildings, and this continues to create increased levels of noise. This work is anticipated to continue into mid-2014. The façade has been separated from the primary structure of the West End. Demolition work at West End should be completed by the end of February. Demolition of the primary structure of Crawford will be completed Saturday, February 8. During the month of March, the Academic Center alleyway and loading dock will be closed as part of the early stages of sheeting, shoring, and excavation. GW staff, faculty, and students will not be permitted in these areas for any reason. Temporary night work continues in Eye Street. This work will be done by and for DC Water in order to complete cut offs of water utility lines. Water outages are not anticipated. This work is expected to last until the week of February 10th. Square 77 Construction Update/January 31, 2014: Demolition work continues on the three existing buildings, and this continues to create increased levels of noise. This work is anticipated to continue into mid-2014. Separation of the façade from the primary structure in Crawford will be completed this week. Demolition of the primary structure of Crawford will be completed by the second week of February. Demolition on the primary structure of Schenley was completed this week. Hand demolition separating the façade from the primary structure continues at West End. Demolition work at West End should be completed by the end of February. This temporary night work will be done by DC Water in order to complete cut offs of water utility lines. This work could produce temporary water outages to some area buildings. If water outages are anticipated they will be communicated in advance. Hauling of the rubble away from the site began today, January 31. This work will increase the number of trucks accessing the site on Eye Street. Depending on weather, temperatures, and site conditions, permitted night work may take place between 7 p.m. - 5 a.m. during the month of February. During this time there will be periodic lane shifting and some noise being produced on Eye Street. Any lane closures will be communicated in advance. Square 77 Construction Update/January 24, 2014: Demolition work continues on the three existing buildings, and this continues to create increased levels of noise. This work is anticipated to continue into mid-2014. Separation of the façade from the primary structure in Crawford will be completed this week. Once completed, machine demolition will begin on the primary structure of Crawford and Schenley. Hand demolition separating the façade from the primary structure began at West End. This will continue over the next couple of weeks. As demolition work transitions from hand work to machines, awareness should be heightened when in close proximity to the construction site. Only authorized personnel should use the alleyways adjacent to the construction site and only for official purposes. Depending on weather, temperatures, and site conditions, permitted night work may take place between 7 p.m. - 5 a.m. during the month of February. This temporary night work will occur intermittently in order to complete cut offs of water utility lines. This work could produce temporary water outages to some area buildings. Any work of this nature will be communicated in advance. Square 77 Construction Update/January 21, 2014: Demolition work continues on the three existing buildings, and this continues to create increased levels of noise. This work is anticipated to continue into mid-2014. Hand demolition separating the façade from the primary structure of Schenley is complete. Demolition on the primary structure is down to the fourth floor. Separation of the façade from the primary structure in Crawford will be completed next week. Once completed the machine demolition will begin on Crawford. Hand demolition separating the façade from the primary structure of the West End will begin next week. Depending on weather, temperatures and site conditions, permitted night work may take place between7pm-5am during Jan 21-Feb 17 at intermittent and temporary periods so as to complete cut offs of water utility lines. This work could produce temporary water outages to some area buildings and any potential impacts will be communicated as this is determined. Square 77 Construction Update/January 10, 2014: Demolition work continues on the three existing buildings, and this continues to create increased levels of noise. This work is anticipated to continue into mid-2014. Demolition work on the top 3 floors of Schenley Hall is complete. Hand demolition at the front Schenley is 85% complete. Hand demolition on Crawford Hall is completed on the top 2 floors. Machine demolition on Schenley Hall and Crawford Hall will begin mid-January. The temporary paving of the new alley between Marvin Center and West End is complete. Installation of support towers at West End is complete. Tie-in of the West End facade into the support towers to be completed the second week of January. West End demolition will begin shortly after the tie-ins are completed. As demolition work transitions from hand work to machines (large muncher), awareness should be heightened when in close proximity to the construction site. Only authorized personnel should use the alleyways adjacent to the construction site and only for official purposes. As the demolition moves closer to the alleys on either side of the construction site (between Academic Center and West End on the west, and between West End and Marvin Center on the east), there will be periodic, intermittent closures of these spaces. These closures will mostly effect Facilities and Marvin Center staff. Periodic, intermittent lane closures continue on the 2100 block of H Street for utility connections. Square 77 Construction Update/January 3, 2014: Demolition work continues to take down the exterior walls on the three existing buildings and this continues to create increased levels of noise. This work is anticipated to continue into mid 2014. Demolition work on the top 3 floors of Schenley Hall is complete. Demolition work began on the primary structure of Crawford Hall on December 23 and will continue at Crawford through the middle of January. Installation of support towers continues at West End. Two of the three towers have been installed with the final scheduled for completion early next week. In order to complete this work a partial street closure is scheduled for Saturday, January 4, Eye Street will be partially closed in front of West End from 6 a.m. until 6 p.m. All garages on Eye Street will be accessible during these street closures. Demolition work will start on the primary structure of West End, once towers are completed. The new alley between Marvin Center and West End will be paved by the second week in January. Periodic intermittent lane closures on the 2100 block of H Street are expected through the beginning of January for utility connections. Within the next month there will be intermittent partial street closings on the 2100 block of Eye Street. This work will take place at night and notice will be provided once dates are confirmed. Square 77 Construction Update/December 20, 2013: Demolition work continues to take down the interiors and portions of rear exterior walls on the three existing buildings and this continues to create increased levels of noise. This work is anticipated to continue into mid 2014. Beginning on December 20, exceptionally noisy work may resume at 8 a.m. until 7 p.m. Monday through Saturday. The top three floors of Schenley have been demolished. Beginning, Monday, December 24 demolition will begin on the structure of Crawford Hall. Night work continues in the alleyway between West End and Marvin Center. This work may last until midnight and is not anticipated to be exceptionally noisy. This is expected to last into mid-to-end January. Installation of support towers has begun at the West End. This work will continue through early January. On Saturday, December 28 and on Saturday, January 4, Eye Street will be partially closed in front of West End from 6 a.m. until 6 p.m. to complete the support tower installation. All garages on Eye Street will be accessible during these street closures. Construction will not take place on December 25 and on January 1. During construction times, there is contractor staff stationed at the ends of the fencing along Eye Street to encourage pedestrians to cross the street and to direct vehicular traffic. When walking around the project site, it is important to cross H and Eye Streets at the cross walks and not walk in the street along the fencing. Square 77 Construction Update/December 16, 2013: Demolition work continues to take down the interiors and portions of rear exterior walls on the three existing buildings and this continues to create increased levels of noise. This work is anticipated to continue into mid 2014. Exceptionally noisy work will not occur before 9 a.m. and after 7 p.m., and will be avoided altogether if possible during the reading and finals period (December 9-19). If you have any questions or concerns please e-mail [email protected] and ca[email protected]. Beginning on December 20, exceptionally noisy work will resume from 7 a.m. until 7 p.m. Eye Street will be partially closed in front of West End from 6 a.m. until 6 p.m. on Saturday, December 28 and on Saturday, January 4 for the installation of towers to support the West End Facade. Garages on Eye Street will remain accessible. During construction times, there is contractor staff stationed at the ends of the fencing along Eye Street to encourage pedestrians to cross the street and to direct vehicular traffic. When walking around the project site, it is important to cross H and Eye Streets at the cross walks and not walk in the street along the fencing. Starting this week the contractor has put in a place a 'dock master". This person will control access into the alley between the Marvin Center and West End. This system will remain in place until project completion. Anyone needing vehicular access to the alley must coordinate with the dock master. Periodic lane closures on the 2100 block of H Street the week of December 15 and on the 2100 block of I Streets the week of December 22 for utility work. Marvin Center fire alarm testing scheduled for December 20. This means the alarms will sound. This means the alarms will sound. Square 77 Construction Update/December 9, 2013: Demolition work continues to take down the interiors and portions of rear exterior walls on the three existing buildings and this continues to create increased levels of noise. This work is anticipated to continue into mid 2014. Exceptionally noisy work will not occur before 9 a.m. and after 7 p.m., and will be avoided altogether if possible during the reading and finals period (December 9-19). The covered sidewalk on the H Street side of this project opened for pedestrian use on December 4. When walking around the project site, it is important to cross H and Eye Streets at the cross walks and not walk in the street along the fencing. Work continues on Eye Street in the installation of the towers to support the West End facade. Square 77 Construction Update/November 27, 2013: Demolition work began, November 24 to take down the interiors and portions of rear exterior walls on the three existing buildings and this continues to create increased levels of noise. Noisy work will not occur during the reading and finals period (December 9-19). Construction of the covered sidewalk on the H Street side of this project began the week of November 18, with an anticipated completion in early December. Work on this continues and is still targeted to open early December. Construction will be suspended for the Thanksgiving holiday but will resume on Friday, November 29. The first phase of demolition will involve separating the façade from structure of Schenley Hall. This work will require the use of jackhammers and saws increasing the amount of construction noise. General interior demolition activities of Schenley and Crawford are under way and are anticipated to continue into mid 2014. Night work will start in the newly finished alley between West End and the Marvin Center. This work will begin at 7 p.m. and continue until midnight, Monday through Friday. There may be some noisy work associated with this. It will last for about 6 weeks. Noisy work will be limited during finals period (December 9–19). The new alleyway on Eye Street between West End and the Marvin Center is now open. When walking around the project site, it is important to cross H and Eye Streets at the cross walks and not walk in the street along the fencing. During construction times, there is contractor staff stationed at the ends of the fencing along H Street to encourage pedestrians to cross the street and to direct vehicular traffic. Two additional crosswalks were installed in late November in the mid-block section of Eye St so as to facilitate pedestrian traffic. Square 77 Construction Update/November 22, 2013: Demolition work will begin on Monday, November 24 to take down the primary structures of the existing residence halls. This will create increased levels of noise. Noisy work will not occur during the reading and finals period. The first phase of demolition will involve separating the façade from structure of Schenley Hall. This work will require the use of jackhammers increasing the amount of construction noise. Beginning Monday, November 25 the Academic Center East Patio and Stairs will be closed until further notice to accommodate the demolition of the Schenley and West End structures prior to the construction of the new residence hall. In addition the patio furniture is being temporarily relocated until the patio area is reopened. The new alleyway on Eye Street between West End and the Marvin Center will open Monday, November 25. Construction of the covered sidewalk on the H Street side of this project began the week of November 18, with an anticipated completion in early December. There will be a mid-block closure of the 2100 block of H Street the weekend of November 23-24 for the installation of construction trailers. There will be vehicular access to the Marvin Center garage during this closure. The grading of the concrete area behind the Marvin Center is anticipated for Friday, November 21 and Saturday, November 22. This work is expected to be noisy. Demolition work behind the Academic Center in the loading dock area was completed on Saturday, November 16. Traffic and pedestrian control continues. When walking around the site, it is important to cross H and Eye Streets at the crosswalk and not walk in the street along the fencing. During construction times, there is contractor staff stationed at the ends of the fencing along H Street to encourage pedestrians to cross the street and to direct vehicular traffic. Two additional crosswalks will be installed by Nov 25th in the mid-block section of Eye St so as to facilitate pedestrian traffic. Square 77 Construction Update/November 15, 2013: Demolition work is anticipated to begin in late November to start taking down the three buildings and this will likely create increased levels of noise. This work will be limited during the reading and finals period. This work could begin as early as November 25. Demolition work behind the Academic Center in the loading dock area will continue Saturday, November 16. This work is expected to be noisy. In order to accommodate the work taking place at Crawford and Schenley Hall, the sidewalk is closed on H Street until the covered walkway is completed, (anticipated before the end of this semester). The Eye Street sidewalk is closed in front of West End and will remain closed through the duration of this project. However, mid-block crosswalks were installed to better facilitate pedestrian access. Night work is anticipated begin the week of November 25, in the newly created alley between West End and Marvin Center. This work should not be excessively loud and may take place until midnight. Construction of the covered sidewalk on the H Street side of this project will begin the week of November 18. There will be a mid-block closure of the 2100 block of H Street the weekend of November 23-24. There will be vehicular access to the Marvin Center during this closure. Construction for the installation of the covered sidewalk will begin on 25th. Steel erection and welding for building façade towers is complete. Erection of trailer towers and welding continues on H Street. Square 77 Construction Update/November 8, 2013: In order to accommodate the work taking place at Crawford and Schenley Hall the sidewalk is still closed on H Street until the covered walkway is completed, anticipated before the end of this semester. The Eye Street sidewalk is closed in front of West End and will remain closed through the duration of this project. Demolition work is anticipated to begin in late November to start taking down the 3 buildings and this will likely create increased levels of noise. This work will be limited during the reading and finals period. Demolition work behind the Academic Center in the loading dock area will resume Saturday, November 8. There will be loud jack hammering work all day. Night work will begin the week of November 18, in the newly created alley between West End and Marvin Center. This work should not be excessively loud. The next phase of this part of the project will be to deliver and erect the actual sidewalk enclosure, followed by installation of construction trailers on top of the covered walkway. This work should begin n mid November with a first phase to include an H Street road closure the weekend of November 16 and 17. There will be vehicular access to the Marvin Center during this closure. Steel erection and welding are about 85% complete in H Street. Weather permitting, the remaining work will take place on Saturday, November 9. Traffic and pedestrian control continues. The installation of two (2) temporary cross walks on Eye Street will be completed towards the end of next week. When walking around the site, it is important to cross H and Eye Streets at the crosswalk and not walk in the street along the fencing. During construction times, there is contractor staff stationed at the ends of the fencing along H Street to encourage pedestrians to cross the street and to direct vehicular traffic. Work is currently underway on Eye Street to install additional crosswalks in the midblock section so as to facilitate pedestrian traffic. Square 77 Construction Update/November 6, 2013: In order to accommodate the work taking place at Crawford and Schenley Hall the sidewalk is still closed on H Street. This is temporary, and the sidewalk will be reopened once the covered walkway is completed. We anticipate that the sidewalk will be reopened at the end of this semester. The sidewalk is closed on Eye Street in front of West End and will remain closed through the duration of this project. On November 4 there was demolition activity taking place on the concrete ramp located Academic Center loading dock. The work was much louder for building occupants than anticipated, the remaining work on the ramp will occur on Saturday, November 9th from 7am – 7pm. Starting November 4, there will be road work to install two (2) temporary cross walks on Eye Street. One will be located between the President Condominium and the Academic Center and the other will be located from the the base of the Marvin Center ADA ramp to just east of the steps into Rice Hall. This work should take about a week to complete, weather permitting. Road closures are not anticipated as part of this work. Steel erection and welding are about 85% complete in H Street. Remaining work to take place on Sat, 11-09-13, weather permitting. Roof abatement work continues on the roofs of West End, Crawford, and Schenley Halls, these workers may be in suits with respirators. This is standard operating procedure and there is no cause for alarm, all work is permitted and is being monitored by an industrial hygiene company. This work began on October 29 and is anticipated to last for approximately one week. Traffic and pedestrian control continues. When walking around the site, it is important to cross H and Eye Streets at the crosswalk and not walk in the street along the fencing. During construction times, there is contractor staff stationed at the ends of the fencing along H Street to encourage pedestrians to cross the street and to direct vehicular traffic. Work is currently underway on Eye Street to install additional crosswalks in the midblock section so as to facilitate pedestrian traffic. Work during the above phases will include periods of above average noise - more details will be provided as the schedule for this work is finalized. Please note that although noise levels at the site have been low in recent weeks this could quickly increase due to a variety of conditions such as if harder materials are encountered as excavation proceeds. The university is striving to provide as much advance notice as possible if this occurs. Square 77 Construction Update/October 25, 2013: In order to accommodate the work taking place at Crawford and Schenley Hall the sidewalk is still closed on H Street. This is temporary, and the sidewalk will be reopened once the covered walkway is completed. We anticipate that the sidewalk will be reopened by the start of the spring semester. The sidewalk is closed on Eye Street in front of West End and will remain closed through the duration of this project. The alley off of H Street, between Crawford and Schenley, will be closed to pedestrian traffic this Saturday 11-2-13 and the following Saturday 11-9-13.After this, the alley will likely be closed for the remainder of the project to accommodate demolition work facing the alleyway. Drilling switched from the building fronts on H Street to the building front on Eye Street. This work will be no louder than it was when the team was drilling on H Street. Work hours on I street, in the curb lane, will shift from 9:30 to 3:30, to 7am to 7pm, regular work hours. Erection of steel work on the H Street side will continue for the steel towers in front of Schenley and Crawford. This work is about 50% complete. This work should not be exceptionally noisy. Some of the workers doing abatement in coming weeks on the roofs of West End, Crawford, and Schenley Halls may be in suits with respirators. This is standard operating procedure and there is no cause for alarm, all work is permitted and is being monitored by an industrial hygiene company. This work began on October 29 and is anticipated to last for approximately one week. Traffic and pedestrian control continues. When walking around the site, it is important to cross H and Eye Streets at the crosswalk and not walk in the street along the fencing. During construction times, there is contractor staff stationed at the ends of the fencing along H Street to encourage pedestrians to cross the street and to direct vehicular traffic. Square 77 Construction Update/October 18, 2013: In order to accommodate the work taking place at Crawford and Schenley Hall the sidewalk is still closed on H Street. This is temporary, and the sidewalk will be reopened once the covered walkway is completed. We anticipate that the sidewalk will be reopened by the start of the spring semester. The sidewalk is closed on I Street in front of West End and will remain closed through the duration of this project. The alley off of H Street, between Crawford and Schenley, will be closed to pedestrian traffic this Saturday 10/19 and the following Saturday 10/26. It may also be closed sporadically between 10/19-10/26 to accommodate demo work facing the alleyway. Starting Monday 10/21, drilling will switch from the building fronts on H Street to the building front on I Street. This work will be no louder than it was when the team was drilling on H Street. In the coming weeks work on the H Street side will prepare for the erection of the steel towers which are expected to arrive in November. This work should not be exceptionally noisy. Square 77 Construction Update/October 11, 2013: In order to accommodate the work taking place at Crawford and Schenley Hall the sidewalk is still closed on H Street. This is temporary, and the sidewalk will be reopened once the covered walkway is completed. The sidewalk is closed on I Street in front of West End and will remain closed through the duration of this project. Excavation trenches for duct bank to begin next week. Continue underpinning pits in the West End, ten remaining after pouring two on Wednesday. Steel installation is completed through the third floor and continues in the West End. Traffic and pedestrian control continues. When walking around the site, it is important to cross H and Eye Streets at the crosswalk and not walk in the street along the fencing. During all construction times, there are contractor staff stationed at the ends of the fencing along H Street to encourage pedestrians to cross the street and to direct vehicular traffic. Drilling supports for the steel towers that will keep the existing historic facades (which will be incorporated into the new structure) in place during construction will last up to two months. Once the drilling is completed the steel towers will be delivered and erected. They come in large units that fit together rather than being built in place. The construction team will attempt to have these very large steel components delivered before 7:00 a.m., however that may not always be possible therefore it will have a significant impact on the vehicular and pedestrian activity as they are delivered and this will happen over a period of days. We will give advance notice on the delivery dates. Work doing the above phases will include periods of above average noise - more details will be provided as the schedule for this work is finalized. Installation of covered walkway, followed by reopening of sidewalk. Please note that all timelines above are indicated as approximate and work times will vary due to site and soil conditions as well as weather -- we will continue to provide schedule changes as work proceeds. Thank you for your patience and cooperation during this initial phase of the work on the new residence hall. Square 77 Construction Update/September 3, 2013: Initial demolition activities are underway in each of the former residence halls. Abatement work is completed in West End and will continue for several weeks in Crawford and Schenley. Pits for tower supports are underway in Crawford, Schenley and West End. Installation of facade support towers will commence upon receipt of permits. Marvin Center Scene Shop abatement and demolition are complete. Work to rebuild egress stairs and landing for book store loading dock will start within coming weeks once permits are received and will create above-average construction noise on a daily basis during the project's initial phases. The trees between Schenley Hall and the Academic Center are scheduled for removal this Friday. Work is scheduled to start early and should not interfere with Academic Center events that afternoon. Delivery and construction truck traffic will continue to be monitored and flag men used as congestion happens. Square 77 Construction Update/August 25, 2013: Initial demolition activities are underway in each of the former residence halls. Abatement work is completed in West End and will continue for several weeks in Crawford and Schenley. Pits for tower supports are underway in Crawford, Schenley and West End. Installation of facade support towers will commence upon receipt of permits. Marvin Center Scene Shop abatement and demolition are complete. Work to rebuild egress stairs and landing for book store loading dock will start within the next 2 weeks and continue into early November. Square 77 Construction Update/August 12, 2013: Initial demolition activities are underway in each of the former residence halls. Abatement work is completed in West End and will continue for several weeks in Crawford and Schenley. Pits in Crawford and Schenley for tower supports are underway. Installation of facade support towers will commence upon receipt of permits. Marvin Center Scene Shop abatement is complete and demolition will start this week followed by rebuilding of egress stairs and landing for book store loading dock. Project perimeter fencing in front of West Hall on Eye Street is installed and the sidewalk will remain closed throughout project construction. The H Street sidewalk in front of Crawford and Schenley Halls is anticipated to be installed within the next 6 weeks and will re-open this fall upon completion of a covered sidewalk. Square 77 Construction Update/ July 12, 2013: Crawford, Schenley and West End residence halls have been vacated and abatement work is underway in all three buildings. Abatement work is expected to continue for the next couple of months. Project perimeter fencing on H and Eye Streets will be installed within coming weeks and will close the sidewalk and curb lane adjacent the existing buildings. The Eye Street sidewalk in front of West End Hall will remain closed throughout project construction. The H Street sidewalk in front of Crawford and Schenley Halls is anticipated to re-open this fall upon completion of a covered sidewalk. Installation of facade support towers will be commence upon receipt of permits.